I had that thought tonight when discussing Amazon's new e-book reader, cleverly named Kindle. My wife asked, "what's with the name?" I said, "who knows, but I'll bet the naming consultants spoke about Prometheus, the fire of knowledge, and the hope that this product will finally kindle a fire in the moribund, impossible-to-start e-book reader market." She said, "I'm just thinking of all the books that will someday be kindling." She's right. This probably won't happen in our lifetime -- we've grown up loving the texture, beauty, and luxury of the printed page. But it's easy to imagine a day when this will matter less. And Amazon -- which has spent years negotiating its way through the book industry -- may be the company that accelerates adoption of paperless book reading. But what will enable Kindle to burn paper faster than any of its predecessors is not just the size the Amazon store. It may be the free wireless broadband connectivity that Kindle provides to the immense Amazon store. It's a brilliant idea; Amazon can easily pay the charges to its telco partner, because the only time people go online with Kindle is when they are ready to download something. It feels like a page from the Apple marketing playbook. In fact, it was kind of Apple's idea. Touche. 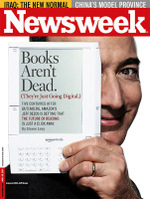 See story about Kindle on Engadget.